Living with Friedreich's Ataxia (Sort of) » Anti choice misusers of disability-Repeal the 8th! 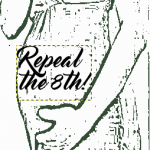 Tag Archive for Anti choice misusers of disability-Repeal the 8th! Anti choice misusers of disability-Repeal the 8th! No comments Anti choice misusers of disability-Repeal the 8th!